Music geeks rejoiced when Mastodon and Primus announced a co-headlining tour for this spring and summer. The 45-show trek of mostly outdoor amphitheaters connects two acts high on musicianship, who are equally embraced by the metal and prog-rock communities. Mastodon has been touring heavily since releasing two albums in 2017: the critically acclaimed Emperor of Sand, and the stylistically diverse EP Cold Dark Place. The band also received its first Grammy, winning Best Heavy Metal Performance for Emperor of Sand leadoff track “Sultan’s Curse.” It was the band’s first Grammy win after five overall nominations in recent years. Following the tour with Primus, Mastodon will embark on another interesting double-bill, a brief fall tour with Dinosaur Jr., and stay on the road until the end of 2018. 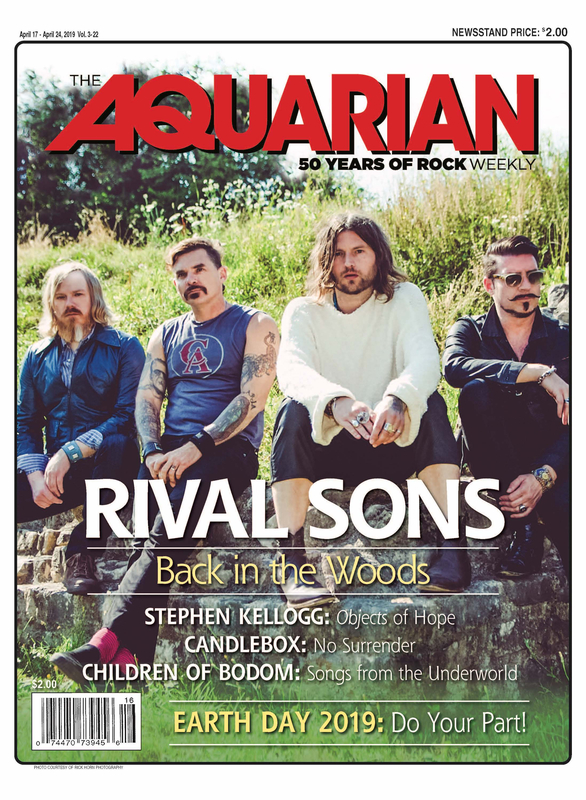 Prior to soundcheck before a show in Birmingham, Ala. drummer Brann Dailor phoned The Aquarian to discuss the current tour, his thoughts on the Grammy win, handling lead vocals while drumming, and other topics. How’s the tour with Primus going so far? Oh man, it’s awesome. All the shows have been great. It’s pretty chill. Have you been a Primus fan a long time? Is touring with them something you’ve wanted to do for a while? I’ve been a Primus fan since the early ‘90s. Around that time, I discovered Primus, Mr. Bungle — all this really cool music started coming out that was right in line with me. It was stuff that spoke to me a little bit more than some of the metal that was coming out at the time. I guess my 15-year-old mind was just ready to go elsewhere. I guess a tour [with Primus] wasn’t really something I considered, but it makes perfect sense. Both bands can kind of float, we can play with anybody. We can play with Queens of the Stone Age, and then play with Slayer and hold our own. In general, how do you enjoy playing outdoor gigs in the summer? You also look at it as a challenge. I’ve seen stars a few time in the [intense] heat. Especially back in the Ozzfest that we did, when we’d go on at like 1:30 in the afternoon. Playing in August in Houston, in a parking lot — those were soul crushers, like 105 degrees and you’d think, this shouldn’t even be legal. This tour is a mix of indoor and outdoor shows. Outdoors, we usually go on around dusk, and our show usually reveals itself over about 20 minutes or so. Then it gets dark and you can see our video popping off and my glow-in-the-dark drum set, and all that good stuff. Speaking of challenges, I could never understand how you sing so well in concert while you’re playing drums. It’s really impressive. Sometimes I am out of breath, but I’ve gotten better at it over the years. It’s always a work in progress, my vocals, but I think I’ve got pretty good at it. As long as I’m in relatively good health, I feel confident going up there, but a lot of times in Europe, in winter, everybody kind of gets sick. The “bus funk,” as we call it. Also, right when Emperor of Sand came out, we played a gig in Missoula, Mont. and I had a wicked throat infection. I tried to sing through it every night, and it was just awful. Troy had to take over some of my parts. It took me a while to get through that. It sucked. Congratulations on your Grammy win a few months ago. What did it mean to the band to win after several nominations? It meant more than I thought it would. I had more of a reaction to it than I anticipated. It’s really an amazing thing. I thought, Stevie Wonder’s got one of those, now I’ve got one too! But with the Grammys, it goes beyond just the music. The recording academy does the Grammys On The Hill thing, where they’re constantly working to make conditions better for songwriters, musicians, everybody involved in creating music. And they do MusiCares, which helps people in need, and music education across the country as well. It’s a massive organization. There’s so much more to it — 365 days a year people are working behind the scenes to have that kind of influence and do good things for people. And the trophy, it’s amazing, for heavy metal, and for the good old American dream as far as a band like ours where we write our own music and it’s just the four of us. We started in our dingy little practice space, and played in basements and VFW halls, and started in our van and worked our way up to winning a Grammy almost 20 years later. That Grammy doesn’t represent just one song, it represents scraping and clawing our way through the heavy music scene. It’s a lot of sacrifice and a lot of work. We’re the ones who rolled up our sleeves and put ourselves out there constantly, and we still do that. That’s how we operate. We never stop working. The Grammy for heavy metal performance has come a long way since Jethro Tull beat Metallica that one year. Yeah, that was a bit strange. That being said, they pretty much invented the Grammy award for Best Heavy Metal Performance, because Metallica got so popular that you could no longer deny that heavy metal was a force to be reckoned with, and a very popular style of music that was filling up arenas. But after many years of taking some flak for stuff like that, I think [the Grammys] really focused their efforts the last couple of years to get teams of people in there who know what they’re talking about with each and every genre. Let’s talk about your Cold Dark Place EP, which I can’t stop listening to. Most of the songs on the EP were left over from the recording sessions for Once More ‘Round The Sun. Did you not think those songs fit the style of that album? We felt like we needed one more [song] to round it out and then we ended up having one more from Emperor that we thought fit with the others. We put out Emperor and just a few months later we put the EP out. We wanted the EP to be a companion piece. If you’re listening to Emperor, as soon as “Jaguar God” got finished, the next one would start. The songs on the EP are really unique, and don’t necessarily sound like traditional Mastodon songs. It’s definitely a different vibe. We’d like to do more of that in the future. We’d like to be as many different styles of music as we like to listen to, which is just about everything, and not limit ourselves to just being this super-heavy prog metal band. We want to try to incorporate all of the styles of music that we listen to. Do you typically have a lot of songs leftover when you write for an album? No, it’s not typical. For some reason, the last couple of albums we’ve had so much. We had a ton of stuff for Once More ‘Round the Sun, and none of us were really ready to give them up. For Crack the Skye, we had that song “Deathbound.” We usually find a place for them. We also don’t want to put an album out that’s too chubby, you know what I mean? We don’t want to put out a 72-minute record. We want to put out a 50-minute record. We feel like 50 to 55 minutes is the perfect album length. And then if we have an epic track, we’ll put that at the end, or we’ll have a nice little suite that ties it all together. Like with Leviathan, we have “Hearts Alive,” this last record we have “Jaguar God,” “The Last Baron” on Crack the Skye. We do that on purpose, to go out with a bang. You’ll be on tour for basically the rest of the year. Does the band tend to write songs on the road? We don’t really write on the road. We sort of collect riffs along the way, ideas here and there. Bill’s always got a little setup going on the road. He’ll take his guitar up to his room on off-days, and sit and play guitar and sees what comes out. So, we just fill the riff bag up and then when we get home and it’s time to write, we’re not walking into a studio with no ideas. We have a whole bunch of stuff that we can work on. It’s a bunch of skeletons for songs, and then we’ll sift through them and we’re either feeling them or not feeling them. When can fans expect another full-length album? If we’re going to keep our same rhythm that we always have, we usually put out a record every couple of years. So, it’ll probably fall in line with the two- to three-year span, because we tour so much. It takes us probably six to eight months to complete a full-length. We’ll probably take December and January pretty much off, and then we usually get in the studio and start riffing pretty quickly. Brann, thanks very much for the chat. I’m looking forward to seeing the band when you get to New York City. Yeah, Coney Island. That’ll be fun. We’ll have a hot dog eating contest! Mastodon will perform with Primus at Penn’s Landing in Philadelphia on May 30, The Stone Pony in Asbury Park, NJ on June 1, and Ford Amphitheater at Coney Island Boardwalk in Brooklyn, NY on June 3.